1. The old filling is removed along with any additional decay. 2. An impression is made of your teeth. A model of your teeth is made and sent to the lab. 3. A temporary onlay is placed on the tooth. 1. The temporary onlay is removed. 2. A conditioning gel is placed on your tooth to prepare it for the new onlay. 3. 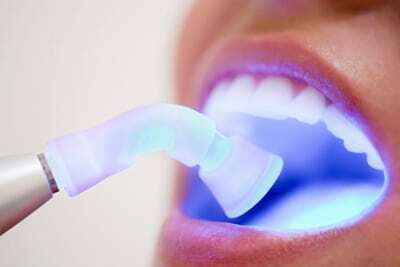 Bonding cement is placed on the tooth and a high intensity light bonds the resin to the tooth. 4. The tooth is then polished.